The Smithsonian National Zoo is opening a new permanent exhibit, a Bald Eagle Refuge, sponsored by the National Zoological Park and the United States Fish and Wildlife Service. Two bald eagles (a female, "Samantha," and a male, "Tioga") will live in this refuge, which officially opens July 4th to commemorate the eagle's status as a national symbol. Although the zoo already had one bald eagle on site, the two "rescued" eagles will live in a 1,250-square-foot enclosed area surrounded by lush greenery that resembles natural eagle habitats. Samantha ("Sam"), the female, was found in Alaska in 1986. Because her wing was damaged, she was no longer able to fly and could not survive in the wild. Until last week, she was living at the American Eagle Foundation in Pigeon Forge, Tenn.
Tioga, the male, was injured in 1998 and also came to D.C. last week from the AEF. Wildlife rehabilitators have saved Sam and Tioga, but because neither can fly, they are kept together in this refuge, separate from the Zoo's other eagle. Zoo director Lucy Spelman says, "This exhibit is a way to get very close to these birds. The female has a bright, white head. She's a mature bald eagle. The male, Tioga, is a younger bird. He's still getting in his head feathers. He has a mixture of brown and white on his head. That's one way to tell them apart. You can also tell the female is sort of in charge. She rules the area right now. So we're just learning about them and how they interact with each other." Visitors to the zoo may stroll up a wooden walkway and view the birds closely from behind a "viewing blind." The eagle exhibit also has a small pond and an area that shelters the two new residents from nasty weather. Dr. Spelman notes, "There's an eagle blind where our visitors can come and see them up close. That's really part of this whole exhibit is getting a really close look at this incredible bird." Visitors will also have the chance to see demonstrations by zookeepers and a video theater detailing the 100 years of work at the National Wildlife Refuge System. For the grand opening on the Fourth of July, Dr. Spelman will be on hand with Secretary of the Interior Gale Norton, as well as Dolly Parton (who is from Pigeon Forge, home of the American Eagle Foundation). The Zoo has come under intense national scrutiny after several mysterious animal deaths in the past few years. In January, two red pandas ate rat poison, which killed them, and a 9-year-old pygmy hippopotamus died unexpectedly. Last year, both a gray seal and a giraffe died in the fall, and a lion died after surgery complications. These incidents followed the deaths of two zebras who suffered hypothermia and starved in January 2000. About the deaths, Dr. Spelman says, "Many people don't realize that the national Zoo is over 100 years old. We take all the concerns that have been raised seriously and it's my job to make sure that we give animals the absolute best place to be and give them the best care and we have a renewal program going on. "This exhibit is a great example of where we're moving toward in the future. Tailoring our exhibits for the animals, bringing our visitors up close, make sure we meet all the needs of the animals and also linking these animals, the bald eagle, to the species in the wild. They really are ambassadors for what's in the wild. 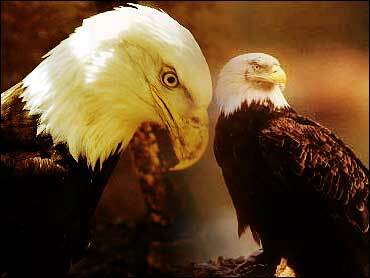 We want people to understand that the reason you have bald eagles is because you have a wildlife refuge system. So I hope you'll come visit," Dr. Spelman says.